Do you love Indian food? Are you a vegetarian? Do you want some bright colors in your bowl when it's dreadfully gray and cold outside? 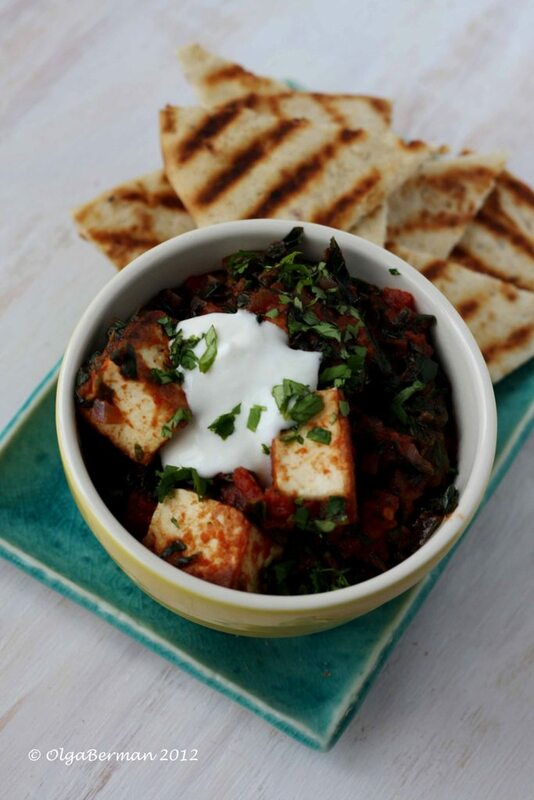 If you've answered yes to any of these questions, you are going to like the Paneer with Tomatoes and Spinach recipe I developed for you this past weekend. 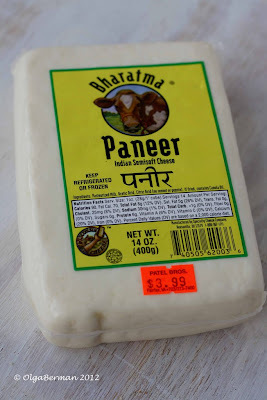 A few weekends ago I had a chance to check out an Indian grocery store and, among other things, I picked up a package of paneer: Indian cheese. This cheese doesn't have a lot of flavor, but is good at taking on the flavors of whatever ingredients you mix into the dish. You can make paneer at home very easily, but there is absolutely nothing wrong with buying it. One of the properties of paneer that lends itself great to this dish is that when it's pan-fried, it doesn't melt! 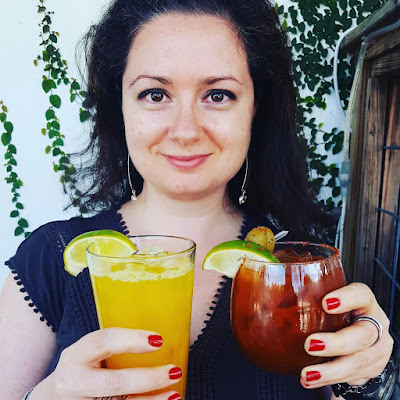 I hope you enjoy this healthy and quick recipe. to serve: rice, naan, cilantro and/or yogurt. 1. Heat the vegetable oil in a pan or skillet with a wide bottom. Carefully add the cubes of paneer and cook until at least two sides of the cheese are golden brown. If you have a lot of patience and time, cook the cheese until all of its sides are golden brown. Be careful while doing this because oil tends to splatter and one of the paneer cubes managed to jump out of the pan while I was preparing this dish. Remove the paneer from the pan and set aside. 2. Add the red onion to the pan and cook for five minutes. Add ginger and cumin seeds and continue to cook for another two minutes. 3. Season with salt and pepper, add diced tomatoes and continue to cook for another five minutes. 4. Add spinach, adjust the seasoning and let everything gently bubble for five minutes. 5. At this point, heat your naan or rice. 6. Add paneer back to the pan and let it heat through. 7. 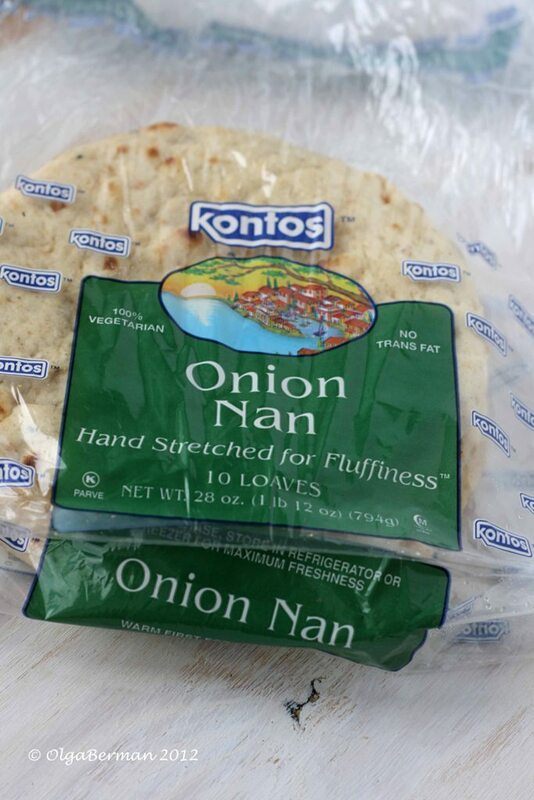 Serve on top of rice or alone in a bowl with a side of grilled naan. Top with yogurt and fresh cilantro. I had the leftovers for lunch today. The flavors only deepen! 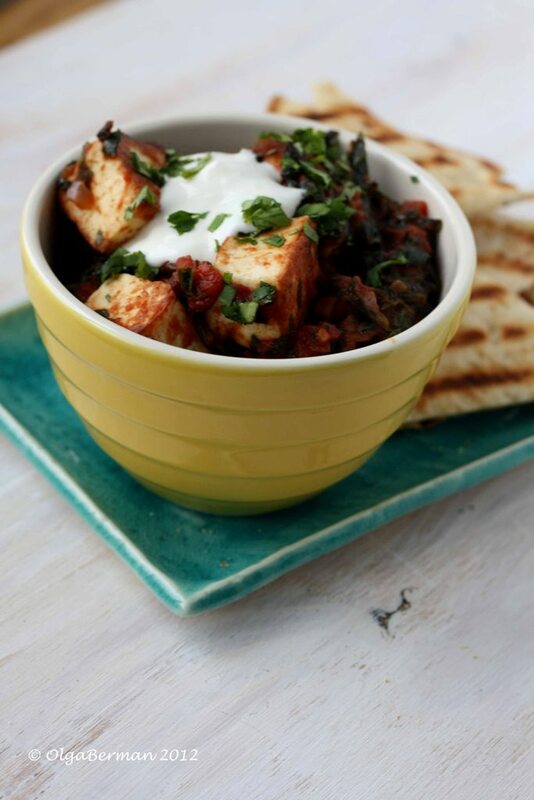 Have you ever made paneer at home? What dishes did you make with it? This looks delicious, I could have some right now! $3.99! WTF! 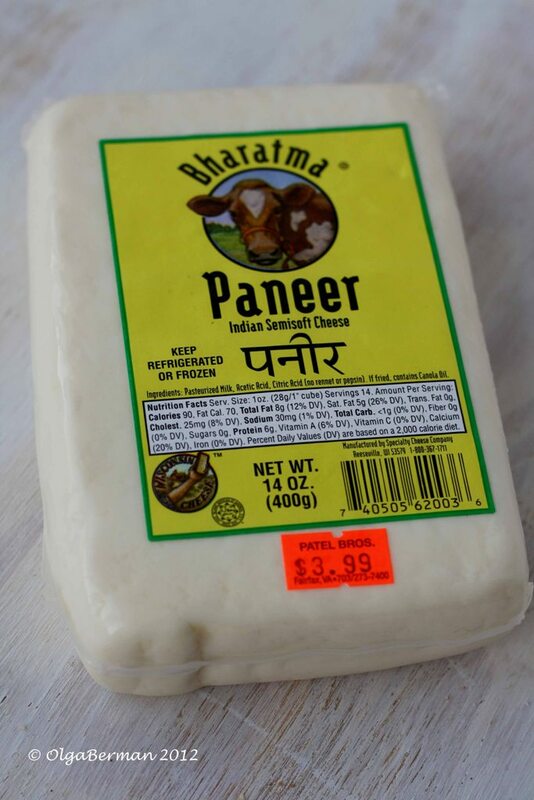 Paneer is $9.99 at Whole Foods. Which store did you go to? I want to go. NOW. It was some random store I happened to find when my friend Daphne and I were driving in VA. It’s called Patel Bros. They had so much stuff there!!! Love the addition of the tomatoes! Love the charred look of the paneer! This is something I must recreate for my Indian-crazy husband! Thanks for making it sound to easy. You're awesome. Ooh, this sounds great! 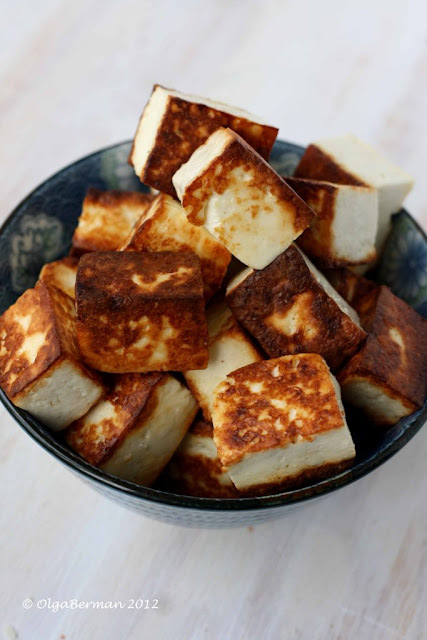 I love paneer - it's like cheesy tofu! Loved this simple recipe. Thanks for sharing! 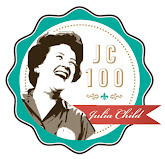 I’m so glad! Thanks for your comment. I shock even myself when I admit I've never had paneer. I guess it's time -- this sounds like the perfect gateway recipe! What a beautiful dish! Indian food is growing on me! 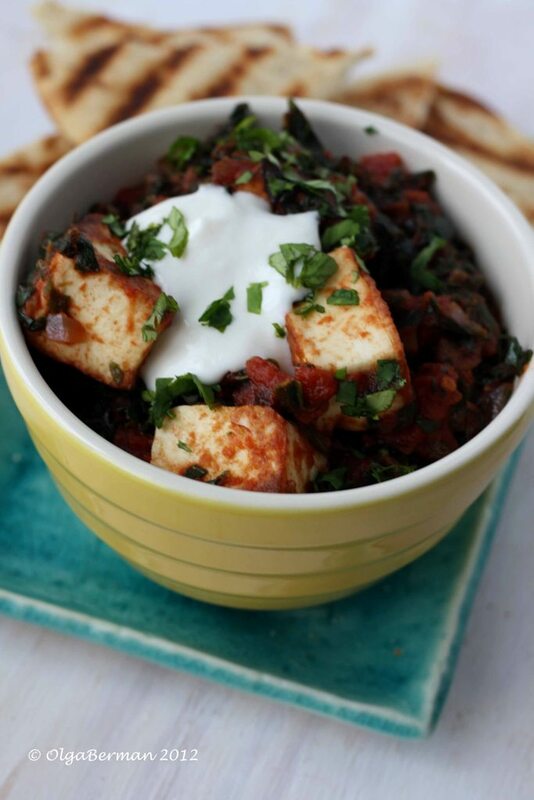 Oooh I love paneer...I will most definitely try this out! Is the Indian food store local? I would love to go! I made an Indian dish last night, but it would have been better with paneer. I'll have to try your recipe. Definitely let me know when you give this a try!